14. Clematis L., Sp. Pl. 543. 1753. Gen. Pl. ed. 5:616. 1754, Boiss., Fl. Or. 1:2. 1867, Hook.f. & Thoms. in Hook.f, Fl. Brit. Ind. 1:2. 1872, O. Kuntze, Verh. Dot. Ver. Brandenburg 26: 83-202. 1881 & Verh. Zool. Bot. Ges. Wien 37: 47-50. 1887, Qureshi & Chaudhri in Pak. Syst. 4(1-2):121.1988. Climbing to erect shrubs, perennials rarely annuals. Leaves opposite, ternately or pinnately divided. Flowers solitary (-2-4) in fascicles or in paniculate cymes. Sepals 4-8, petaloid. Petals absent but filaments or staminodia sometimes petaloid. Stamens numerous. Carpels forming a small subglobose head. Ovules solitary, pendulous. Style often much elongating after flowering, plumose-hairy. A genus of c. 250 cosmopolitan, but chiefly temperate species. Species with petaloid filaments or staminodes are sometimes separated in subgenus Atragene L.
Several species as Clematis hybrida Hort. 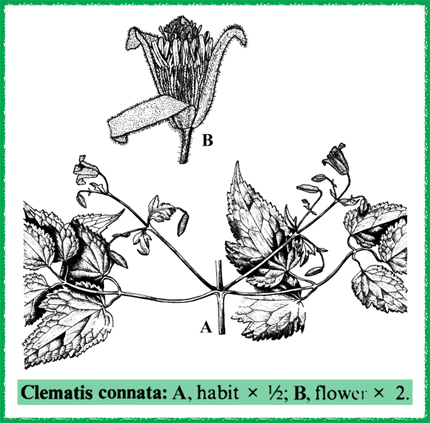 and Clematis flammula L. are cultivated in gardens for their ornamental value. No poisonous plants are known in Clematis. Represented in Pakistan by 10-11 species.